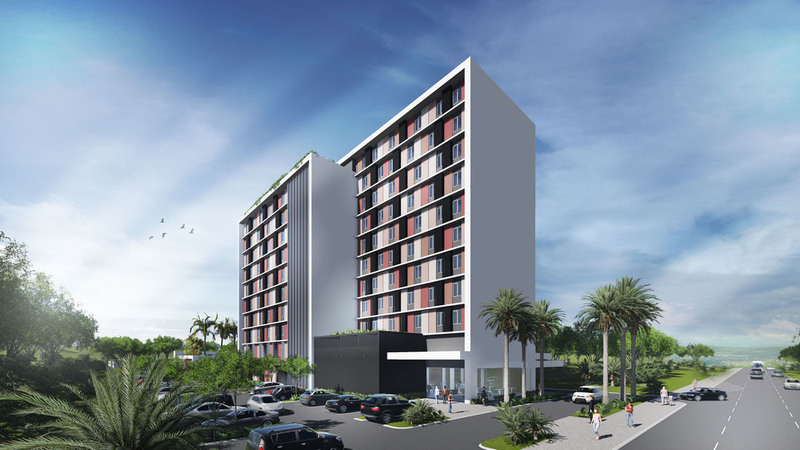 This hotel, to be built in the outskirts of Ribeirão Preto, an affluent medium-sized city in upstate São Paulo, Brazil, will join a new hotel chain under development across the state and elsewhere in Brazil. The hotel consists of 198 rooms, divided into two blocks with 8 and 9 pavements, respectively. They are articulated by a central atrium where the hotel reception is located. The hotel also provides its guests with a convention center, restaurant and wellness center, which are located on the ground floor, as well as other leisure facilities such as a swimming pool and fitness center, wich are located in the mezzanine. The façades of the building are covered by modulated panels which create an interesting and dynamic effect, integrating the different floors into a single mosaic that accentuates the vertical lines of the project.